What you can do with RM35? Buy yourself a dinner in a fine restaurant? I don't think it will be enough. What if I tell you this amount of money could help children get education? In the Good Samaritan Home, numbers of underprivileged children are waiting for people to fulfil their dreams. They do not have enough resources for them to get better education unless the public are supporting. Goo Samaritan Home is a non-profit charitable children's home located in Klang, Selangor Malaysia. There are currently 32 resident children and another 30 children in the Extension Program. These children have been going through a lots of issues. There are those who has derelict parents, or shattered home with different kind of parents. There are those who were abandoned, lost their parents, or that the parents who ran away. Visit Good Samaritan Home Facebook to find out more. On 7th September 2014 (Sunday) from 10am to 6pm, save your day up to pamper yourself while helping these children at Kota Damansara, Dataran Sunway! Amante nail spa and body care partners with the Good Samaritan Home to raise RM 80 000 for their children. Just purchase an Amante Charity Fair booklet for RM35 and you get 7pcs of RM5 cash voucher for your pampering services. Also, as a bonus, you are entitled to a RM88 Hot Stone Massage treatment FREE! 25% of the sale will proceed to charity. That means, you are actually helping the under privilege children while getting your nails painted, or preparing yourself for a luscious date tonight! Other than that, that are also other services like Massages, face art(mother with children look here!) and hair do! Guys, it is time to pamper your love ones and have fun with them. Get your mother-aunties-girlfriends the vouchers and let them enjoy themselves. They will thank you for sure! Also, there will be games and performances to live up the event. Why not some cotton candy or popcorns while waiting for the draw of the luck? 1. Purchase the Amante Charity Voucher booklet from the nearest Amante outlet. Visit www.amante.my for a list of locations near you. 2. Don’t have time? You can transfer/bank in to Amante Beauty Care Sdn Bhd (MAYBANK ACC NO. 512491131743). Send transfer note/bank-in slip to amantecharity@gmail.com with name, e-mail address & mobile number. 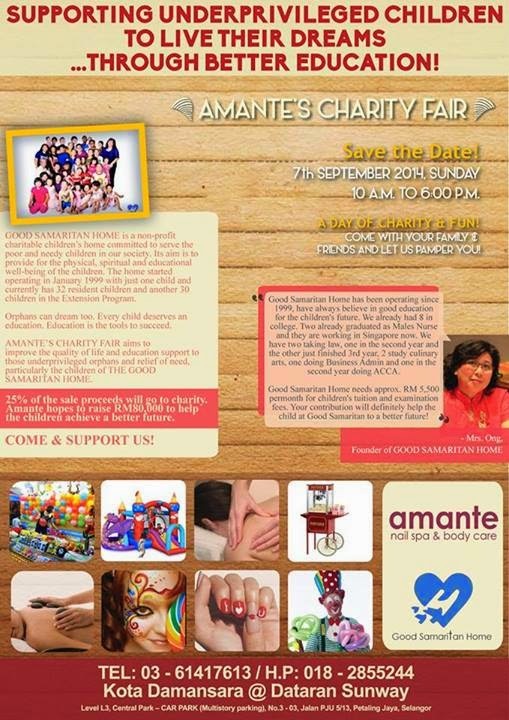 You can collect your Amante Charity Coupon Booklet on 7th September, 2014 at Amante Charity Fair. Also, do support them on their good deeds by giving them a like on Amante Nail Spa & Body Care Facebook Page.